According to the FBI’s Uniform Crime Data report, there were over 770,000 motor vehicles thefts in 2017 which resulted in about $6 billion in losses? That’s a lot of cars, but yours doesn’t have to be one of them. Here’s some advice to help keep your car out of the hands of thieves. Never leave your car running unattended. During cold weather months, it might be tempting to let your car warm up outside as you finish getting ready. But unless you have a remote starter and can keep the doors locked, you may be inviting trouble. Keep car doors locked. In most cases, vehicle theft is a crime of opportunity. There are countless stories of thieves simply checking doors for easy access. 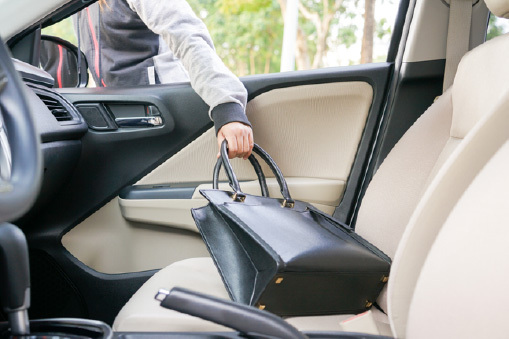 Leaving your car unlocked, even for a short time right outside your home, is sometimes all it takes for a theft to occur…either of the car itself of the valuable items it might contain. Remove or stow valuables. Don’t leave your wallet, handbag, cellphone, laptop, backpack, or anything else of value in plain sight. If you’d rather keep one or more such items in the car, lock them up inside the trunk. Park in well-lit, busier areas. Most thieves prefer to conduct their business in the dark. So, if you’re going to be out at night, park in a well-lit area, preferably on a busy street or well-attended parking. Be aware of your surroundings. During and around holidays, thieves will often loiter around parking lots and wait for shoppers to leave their purchases in their cars before they continue shopping or grab a bite to eat. Invest in anti-theft devices. Window and door alarms, ignition cut-off systems, steering wheel locks, etc., can help make your car the one a thief skips right by. Think twice before purchasing a cloth top. It doesn’t take much time or effort to break into a car with a cloth top – all that’s needed is a sharp knife. But if that convertible is calling your name, make sure you follow the precautions above to reduce your chances of being victimized. We’re Air Professionals, your local home heating and cooling experts. Contact us any time for the service you need, when you need it.